For nearly a generation, pundits, academics and journalists have written off suburbia. They predict that the future lies in the cities, with more Americans living in smaller spaces such as the micro-apartments of 300 square feet or less that New York and San Francisco are considering changing their building laws to allow. Even traditionally spread out cities, such as Los Angeles, are laying out plans to create greater population density, threatening the continued existence of some neighborhoods of single-family homes. Yet wishing something dead does not make it so. Indeed, the suburbanization of America is likely to continue over the next decade. The 2010 Census — by far the most accurate recent accounting — showed that over 90% of all metropolitan growth over the past decade took place in the suburbs. Some central cities, notably New York, enjoyed decent population growth, but their increases were still below the national average. The Joint Center for Housing at Harvard notes that, only five metro areas —Boston, San Diego, San Jose, Calif., and the Florida cities of Cape Coral and Palm Bay — saw an increase in the share of households living in core cities relative to their suburbs and exurbs. To be sure, the Great Recession slowed the growth of suburbs, as many Americans lost the ability to achieve their dream of owning a single-family house. “Back to the city” advocates have seized on Census estimates for the past year that suggested that urban core growth has actually been a tad faster than that of suburbs. However, the Census Bureau numbers may be less accurate, and certainly less predictive, than many suggest. University of Pittsburgh urban analyst Chris Briem points out that in the last decade, some Census Bureau city estimates turned out to be vastly exaggerated compared to the actual 2010 Census. This was particularly true in Chicago and New York, where constant lobbying by city officials — after all, federal aid is distributed based on population estimates — meant that optimistic urban estimates turned out to be hundreds of thousands of people off. More amazing still, the Census Bureau essentially assumed that growth was even in all municipalities in a county. This bizarre practice projects that growth, say, in the city of Los Angeles, is equal to that of newer communities like Santa Clarita, or that suburbs of Alleghany County grew at the same rate as the city of Pittsburgh. This surely can’t be the case. Reporters concentrated in Manhattan and the District of Columbia didn’t look seriously at these numbers. They repeated the assumption that this was the result of mass migration, particularly among the young, out of suburbs and into cities. Yet in reality, there was no evidence of that trend. In fact, the Census Bureau’s core county estimates (which are demonstrably more accurate than the municipal estimates) showed a slight core county loss in domestic migration over the past year. The real story of the estimates has to do with the recession, which has led to record-low levels of mobility. Inter-county migration has fallen almost half from its 2006 level. Essentially, a historically weak economy has boosted the city share of population growth. So what can we expect in the future? Some cities will grow, but the vast majority of metropolitan growth will continue to take place in what are still car-dominated suburbs like areas areas. This can occur only the economy again get on a full-fledged growth cycle. 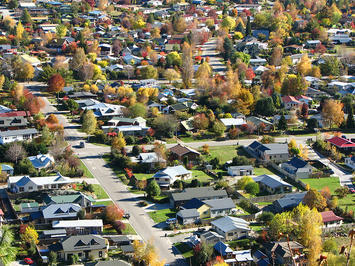 Here some basic reasons not to write off suburbia. All 15 of the fastest-growing metropolitan areas of the past decade — led by places like Las Vegas, Raleigh, Phoenix, Houston and Dallas-Fort Worth — are sprawling and have low-density cores. Metropolitan areas with far denser cores, such as New York, Boston, Chicago, and San Francisco, tended to display below-average growth. These fast-growing cities tend to be suburban in form, dominated by single-family homes, automobile commuters and with dispersed economic centers. The growing central cities of Phoenix or Houston look more like places such as Long Island or Santa Clara than Manhattan or Chicago. Many urban boosters cite a Santa Fe Institute study claiming that density creates productivity and economic growth. However, the study clearly dissociated itself from this argument, claiming that it did not matter if a region was shaped like Los Angeles, Atlanta or Houston, or New York or Boston. The source of productivity lay simply in a growing metropolitan population, the authors claimed. Overall, it’s questionable whether city economies perform better over time than the suburbs. Indeed, over the last decade, 81 percent of the population growth of core cities was among the poor, compared to 32 percent in suburbs. Poverty anywhere is a bad thing, but the claim, made repeatedly by some pundits that it is worsening more in suburbs turns out to be, well, just another urban legend. Overall poverty accounts for nearly one in four urban residents, twice the rate for suburbs. Ever since the energy crisis of the 1970s, pundits have predicted suburbanites would be forced to give up their cars. But higher energy prices have not slowed the suburban trend. With the current growth in new energy finds both here and abroad, the much heralded dawn of “peak oil” appears to be about as imminent as a balanced federal budget. Some terrified urbanists, like Bruce Fisher, director of the Center for Economic and Policy Studies at Buffalo State College, fear the new oil rush means “suburban real estate development will once again enjoy a comparative advantage over center city development.” In what some see as a catastrophe for both planet and urbanity, the car will remain dominant for the foreseeable future, despite three decades of massive spending on new transit systems across the country. The advocates of a dense urban future usually point to demographics. Yet the formerly fashionable theory that retiring boomers would head en masse to cities turned out to be largely false. The last census showed the vast majority of aging boomers remained in the suburbs or moved further out into the periphery. “Back to the country” actually far outweighed “back to the city” in terms of boomer migration. Then there’s the other large generation of Americans, millennials, who are said to prefer an urban lifestyle. Yet surveys of millennials show a strong, often even more marked, preference for homeownership and suburban living than their parents. This will prove critical as many now urban millennials begin to enter their 30s and 40s over the next decade. Once they marry and start to have families, they will emerge, as the Harvard housing study notes as “the primary driver of new household formations over the next two decades.” Along with the other powerful force, immigrants, most seem likely to end up in suburban locales, if they can. This does not counteract the fact that many young people will chose to settle in dense urban areas for their 20s and early 30s. Some urban cores, notably New York, Boston and San Francisco, will likely grow and get denser. But most others will see only modest, often fitful growth; despite massive public investment, for example, downtown Los Angeles, according to Zillow.com, has foreclosure rates worse than virtually anywhere else in the region. Preferences are the key here, particularly paying attention to what people want as they age. The 2011 Community Preference Survey, commissioned jointly by the National Association of Realtors and Smart Growth America, found that only a small minority — less than 10 percent — favored a dense urban location. Some 80 percent expressed preference for a single-family home. Over time, in a market-based economy, consumer preferences matter far more than those of pundits, professors or, for that matter, rent-seeking real estate developers. The only things that can kill off future suburban development would be forced densification by government edict or a continued miserable economy that entraps millions of the unwilling in dense urban areas. But: "The only things that can kill off future suburban development would be forced densification by government edict or a continued miserable economy that entraps millions of the unwilling in dense urban areas." 'The only things', really? A bit categorical in my view. Submitted by Kigaty34 on Fri, 02/01/2013 - 07:10. Submitted by Woogie on Thu, 08/02/2012 - 18:36. Many of learned focused on society's future remain tied to historic perspectives on habitation, transportation, and human behavior. People will continue to flee dense urban settings because of employment, transportation, and quality of life issues (e.g. safety, schools). Suburbs become ever more viable as businesses continue to migrate away from the high tax, low value dense urban areas during what will be a protracted recovery. High unemployment and the shift away from company supplied benefits has many former commuters becoming contractors and consultants. Many in these roles work remotely or from their home office, commuting to an airport, a client, or an office only as necessary. Mass transit as we now have it is doomed to be ever more uneconomic, inconvenient, and in many places unsafe. Electrified vehicles guided by a something other than the driver are not far off and will prove the death knell for new mass transit. This new type of transportation can be efficient, safer, and goes only where the occupant wishes. Given a choice many wish to have more space that is "theirs". A BBQ, garden, garage, better schools, and the freedom to be human are compelling and attractive - those planning the future should reflect less on what was and more on what will be, because the only thing that is certain is it won't be the same. Submitted by lyle on Thu, 08/02/2012 - 21:45. In particular the urbanists want folks to live where playing music loud can bother the neighbors. That is one reason to like more personal space. Submitted by mnemos on Thu, 08/02/2012 - 17:05. It seems so strange to me that urbanists won't face the issues with city living. The benefits of walkable neighborhoods, available arts and entertainment, and the vitality of urban life are obvious - and many find them attractive. I don't think that needs much discussion. The problems of urban poverty, crime, and schools are what urbanists need to face. As long as that doesn't get the treatment it needs urban population growth will be limited to the very wealthy who can pay for private schools and their own protection. It is the reason why so many come in to the museums and leave before dark. Leaving the city is the way middle class people can afford better protection and better schools. As long as urbanists are progressive, they will not be able to deal with crime and poverty as it exists in this world. In this world crime and poverty are partially self propogating via poor choices. The progressive inability to recognize that some choices are poor due to a naive understanding of tolerance explains a great deal of urban poverty and crime. The common progressive conception that the criminal justice system is unfair because incarceration rates are based on criminals being caught rather than racial population statistics is a problem with progressive thinking. If urbanists could address these problems in a more realistic way would make urban living a more attractive alternative for modern living. Submitted by grcarch@charter.net on Wed, 08/01/2012 - 13:41. That the public at large prefers an unsustainable and environmentally destructive condition is hardly an argument in its favor. True, the development industry as a whole hasn't figured out how to build at high-densities and make a buck, and would prefer to pave over the countryside. This fact does not augur well for the future except that the young will either find another way, or consign future generations to diminished opportunities for ease and comfort in a hotter and more hostile earth. Wait until India and China really get rolling, and begin to adopt the suburban norm; things will get really interesting, especially since they both largely burn coal to produce energy. Better mankind survive than that suburbs continue as the norm for habitat; unless you are looking forward to THE Apocalypse. Stinking, cacophonous, over-crowded, ant hills. Submitted by HenryMiller on Fri, 08/03/2012 - 05:42. Maybe you think "surviving" in stinking, cacophonous, over-crowded, crime-ridden, ant hills is a good thing. I don't. Have you ever seen those lab-rat studies where rats in over-crowded conditions, even given all the food the want, basically go nuts? The get violent, aggressive, and murderous, if rats killing each other for no apparent reason can be described as "murder." They form what amounts to gangs. The birth rate drops drastically. What's not "sustainable" is trying to impose those conditions on the human race.